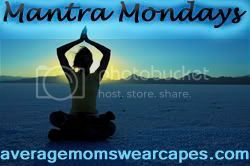 Average Moms Wear Capes: Welcome to Average Moms Wear Capes! And A GIVEAWAY PARTY! Welcome to Average Moms Wear Capes! And A GIVEAWAY PARTY! Hurrah! So what do you think of my new place??? I'm so excited I want to celebrate! And I'm going to, with an ENTIRE WEEK OF GIVEAWAYS of ALL MY FAVORITE THINGS!! 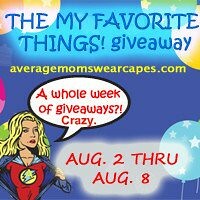 It's "THE MY FAVORITE THINGS" Week O' Giveaways, starting RIGHT NOW! But you have to pay attention because each day is a different giveaway and you only have 24 hours to enter once each giveaway is posted! I have spent a long time in sort of a flux over Baby Tea Leaves. When I left my career as a news writer, I blogged about my family as an outlet. I loved my family blog so much and believe you me, there was never a shortage of material, especially when the babies turned into toddlers and all of that craziness that ensued. But then, somewhere along the way after the babies, I had a rediscovery. I rediscovered myself, and it was mostly through my post-partum weight-loss journey. So that's what I started writing about. Every little painful pound lost, every ounce of blood, sweat and tears I shed, I wrote about. I still wrote about the babies and their crazy stories, but now I was writing so much about weight-loss and fitness and it was all under Baby Tea Leaves and as I began to evolve, it just didn't fit anymore. I needed something to fit me and everything that I had discovered about life, not just about motherhood, but about life in general. If you know me, you know that my weight-loss journey took me through 50-something pounds and it was hard. Because when I started out, my stomach touched the steering wheel. And I wasn't even pregnant! But what I went through was character building. It was confidence-building. And at some point, it became less about the weight-loss and more about the journey and I began to look at myself in the mirror and like myself again as a person, as a wife, as a mother. Because I had found my cape! And not only that, I realized that everyone has one! They're just hiding underneath our mom-clothes! We are so many things to so many people, yet we give ourselves so very little credit!! But I've seen your capes! They're there! Truly they are! I have even seen them poking out of your blogs! From my wonderful girlfriends in real life to the very many awesome women who have inspired me with their greatness here in the blogosphere, I have seen your capes! Yes, we were capable of so much before children (do you remember? It feels so long ago to me!) and sometimes we tend to lose that after the children, or at least I did. I totally did. If you didn't, then you are already wearing your cape out loud and hurray for you!! But one thing I realized was that even with all our new responsibilities, and especially because of our new responsibilities, that term "Super Mom" applies to all of us average mommies everywhere. Because we wear every hat in the world from doctor to coach to chef to chauffer to vending machine. And that's how "Average Moms Wear Capes" was born. So, I hope you'll follow me from Baby Tea Leaves and I hope you'll subscribe and bookmark and come back and visit. I'm going to do things a little differently here, I'm going to highlight workouts, have a Mom of the Month, do some more vlogging, talk about my time in the trenches with toddlers, recipes, reviews, etc. etc. And while you're at it, take a look around, I've posted all my workout plans and food plans (if you care to know them) and a bevvy of all my other faves up on the tabbies up there. OK, so more on this crazy week of giveaways! Go on over RIGHT NOW to where I am giving away a Bondi Band. I will be posting a new giveaway each night at Midnight eastern time, so come back early and often to enter! The giveaways end at 11:59 pm the same day (it's a 24 hour giveaway) and at midnight a new one will post! These are all my absolute favorite things in the world and it will all end on Sunday August 8th with a big old Twitter party at 8-9:30 p.m. Eastern Time. We'll talk about fitness and motherhood and wearing your cape out loud and everyone who participates will have a shot at winning some great prizes. 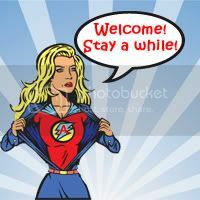 You can see my Tweets at @christieo AND @MomsWearCapes and on "Average Moms Wear Capes" on Facebook too!! I'm excited for this change! So please hang around, mkay? Love you and so excited that you've made this leap and made this change. Because even though I didn't know you before this change, you've come so far and it's amazing. You wear your cape proudly and it's blowing in the breeze behind you on your bike or when you run and floating along behind you as you swim - you wonderful crazy tri lady! Have I mentioned that I love you? Yep, sure do. It's an honor to have you in my life. I LOVE it! Love you! You're my hero. You? ARE SUPERWOMAN! You are amazing and wonderful and awesome and love and light. I am so blessed to know you and I cannot WAIT to watch you grow in your superherodom. Now get the hell out of the way, I've got a Bondi Band to win! LOVE, LOVE, LOVE the new look! I can't wait to read all of your "jewels" and check out all of the nooks and crannies! We really must wear capes at our second annual TSJ Half Marathon next year! You see, I am counting on it and absolutely assuming there will be one in 2011! Love you... You are such an inspiration to me! I love the new blog. I might miss the old one for a bit, but this one is wonderful. It is going to take a little time to see it all. Congratulations on a job well done. Love your blog, glad you found mine and now I have found yours and look forward to reading yours. Following you back from MBC. Have a wonderful day. LOVE IT! CAPITAL BOLD LETTERS LOVE IT!!! You have grown into a superwoman for sure from where you once were. Actually I think you had it in you all along, you just figured out how to let her out. Glad to be a part of your official transformation! Great post...Awesome blog! I'm a new follower from Simply Follow on MBC! Would love for you to come visit and follow me!